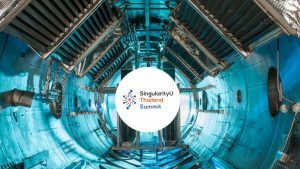 Bangkok (Thailand) – July 4, 2018 (travelindex.com) – “We can no longer judge future performance from the past experiences,” Jeffrey Rogers, Director of Singularity University’s Faculty Development, announced on the first day of SingularityU Thailand Summit. The statement went against everything we knew – of action and repercussion, of causality, of the way the world operates. After two days of intense discussions and talks, we learned that the statement was only the beginning. To say the world is moving at a fast pace is perhaps an understatement. “Our brains are not wired to perceive the change of pace in the world right now,” said Peter Diamondis, Singularity University’s Co-founder and Chairman, “It leads to conflict, because the story we see is no longer a linear narrative”. To guide everyone through the new era, here are the six things industry leaders, inventors, economists, and scientists told us at the SingularityU Thailand Summit 2018. From the birth of the internet to the commercialised DNA sequencing, technology has been grabbing us at the faster and cheaper rate. The often-cited Moore’s law has been widely interpreted to explain the phenomena; the more people using the technology, the cheaper the technology will get. “The future of AI is the future of democratization where everyone has a super powerful AI in our pockets” said Ramez Naam of Singularity University’s Energy and Environmental Systems Faculty. If you have been reading any articles that involve technology, business, or industry, you cannot escape the buzzwords of the hour; Innovation and Disruption. For many, the two is used almost interchangeably, and for the most part, it almost makes sense; when you create an innovation, you cause disruption, and vice versa. However, as Bohdanna Kesala, Fine Arts artist and Director of Singularity University’s International Summits, would tell you, the two words are a world apart. The definitions rang true in other observations. In his “Spice and Ice” talk, David Roberts of Singularity University’s Faculty of Innovation and Disruption used an example of Fredic Tudor’s Sawdust-insulated ship as an innovation that allowed ice to be shipped to a long distance, while the fall of spice trade with the emergence of ice trade as the disruption, as ice became the preferred method for food preservation. In talks of technology and its exponential advancement, one of the questions that inevitably came up at the table is this; will AI take all our jobs? While the answer from the futurists may not surprise you, one of their reasons will – your job is already killing itself, or rather, the bureaucracy in which the job system inhabits is. In the more deliberate sense, it is more about acquiring consensus that is rendering your job obsolete. “If you want to stop an innovation, create a committee around it,” said Naam. This was not the case of the new economy either, as Naam compared between China and Europe in the ancient time, with China as a highly-organized bureaucratic society, and Europe as an eclectic clutter of cultures. From the disarray of ideas, Europe came through with the cultivating, crossing, and combining of doctrines and was able to develop quick cycles of experimentations, and emerged successful centuries after. In the new economy, autonomy has been the key focus in the work culture, especially in the areas where creativity is needed. Providing autonomy and safe space to experiment has become the pivot of many new company models to foster new innovation, and consequently, increasing the chance to survive. While that may be true, with AI merging into various aspects of human-facing technologies, from Tesla’s machine-learning cars, to smart assistants, AI is not all there is. Dr. Daniel Kraft, Singularity University’s Chair of Medicine and Neuroscience, showed an example of artificial heart muscle that simulates the pumping of blood at a natural place, produced in collaboration of doctors, material manufacturers, and 3D printing technology – an example of a union that could put forward the development of human’s well-being and society. We’re living in the best of time, and we’re living in the worst of time. Because, as inventors agreed, the technology, even the best and most advanced form of it that we are using right now, will be its worst version. SingularityU Summits are two-day conferences held around the world to help local leaders understand how exponential technologies can be used to create positive change and economic growth in their region. Summits become an annual point of contact and inspiration for the local community, a catalyst to accelerate a local culture of innovation, and an opportunity to highlight breakthrough technologies, startups and ideas. SingularityU Summits are attended by the general public, government officials, entrepreneurs, investors, NGOs, impact partners, and educators, and may include educational tracks for government and youth. Singularity University (“SU”) is a global learning and innovation community using exponential technologies to tackle the world’s biggest challenges and build an abundant future for all. Our collaborative platform empowers individuals and organizations to learn, connect, and innovate breakthrough solutions using accelerating technologies such as artificial intelligence, robotics, and digital biology. Our offerings include educational programs, conferences, innovation workshops, corporate and startup accelerators, social impact programs and online news and content. Our global community spans more than 110 countries, and includes entrepreneurs, corporations, development organizations, governments, investors and academic institutions. With more than 370 impact initiatives, the SU community is driving positive change in the areas of health, environment, security, education, energy, food, prosperity, water, space, disaster resilience, shelter and governance. A certified benefit corporation, SU was founded in 2008 by renowned innovators Ray Kurzweil and Peter Diamandis, and is partnered with leading organizations such as Google, Deloitte, Genentech, and UNICEF. SU is headquartered at NASA Research Park in Silicon Valley. About Exponential Social Enterprise Co., Ltd. The SingularityU Thailand Summit is brought to Bangkok, Thailand, by Exponential Social Enterprise Co., Ltd. Exponential Social Enterprise Co., Ltd. is an organization aiming to push forward Thailand’s potential for growth beyond existing economic models and social development. We want to share our experiences and arrange seminars to prepare for exponential change that will affect all sectors, including business industry, society and the community. Copyright © 2018 TravelNewsHub.com is owned and managed by Travelindex.